They served their pies in bowls, which made me think that they were really expecting the pie to be served with ice cream. I like the contrasting colors of the two bowls in this picture. I'm also very pleased with this picture of the almond joy pie. 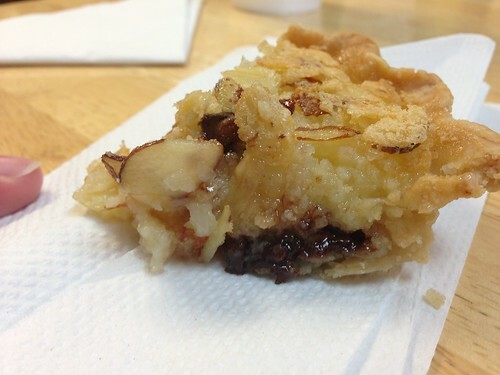 The pie was very good - the pie crust had some crispness, even if it was intended to accompany ice cream, and the layers of chocolate, coconut, and almond filling were excellent. The strawberry-peach pie was less photogenic, but even more tasty. 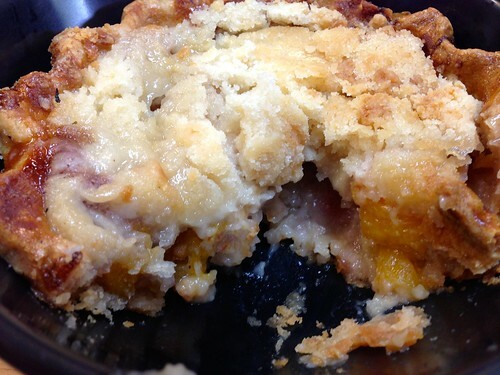 Lori described it as "delicious crust with sweet mellow strawberry and peach flavors". 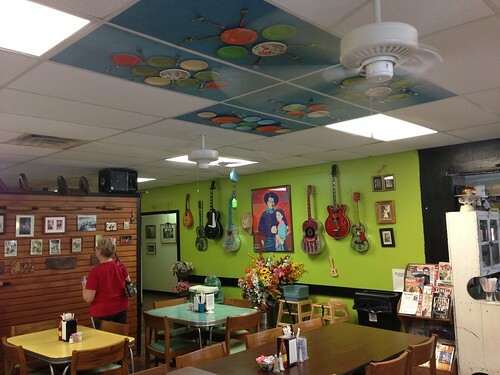 The decor of the Texas Pie Company was a cheerful hodgepodge. Since we were still thinking about crafted and uncrafted places from our trip to Lockhart, we discussed which of those two applied here, and we concluded that despite its ramshackle appearance, it nevertheless seemed crafted, as if someone had carefully chosen the mismatched tables. 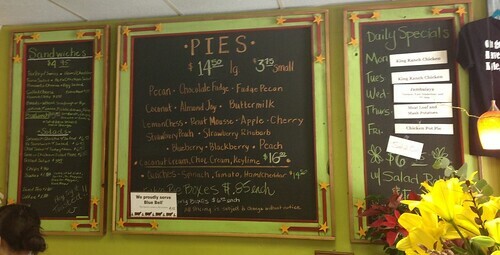 We would very happily return to the Texas Pie Company. It was here and now that we hit our collective wall - or at least our collective speed bump. The plan I'd drawn up called for us to visit the Cathedral of Junk that afternoon, but none of us had the oomph to do so. We sat around the table for quite a while after the pies were gone, and when we did finally leave, we returned to the hotel for a brief nap before setting out again in the evening.